There’s only one thing you need to know about Beartown: hockey. Its people live, eat, and breathe by the laws of hockey. Beyond that there isn’t much to it—only a few steady jobs, no tourists, and surrounded by forest in a part of Sweden where the frigid air of winter only takes a break for a month or two in the summer. The good news is that with the junior team they currently have Beartown is ready to be put back on the map, to have money finally flow back into the town. It’s all due to one player, the kind of athlete that only comes along once in a generation, 17-year-old Kevin Erdahl. After the team wins the semi-finals Kevin throws a huge ‘parents out of town’ party and what happens that night not only changes the trajectory of the team, but of the town. 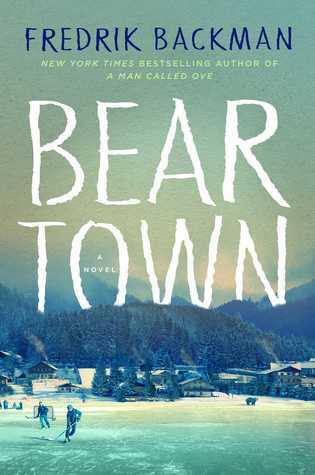 This is Beartown, the powder keg new novel by Fredrik Backman. So the first thing that happens in a conflict is that we choose a side, because that’s easier than trying to hold two thoughts in our heads at the same time. The second thing that happens is that we seek out facts that confirm what we want to believe—comforting facts, ones that permit life to go on as normal. The third is that we dehumanize our enemy. Kevin may be at the center of Beartown hockey, but he is only one of a nuanced cast developed by Backman. The beating heart of Beartown is the Andersson family. Father Peter was Kevin over thirty years ago—the first player in the town to make it all the way to the NHL. After an injury he returned home with his wife, Kira, and their children Maya and Sam. He’s the general manager for the hockey club while Kira is a lawyer, who’s settled uneasily in Beartown, but works in a nearby city and commutes. Maya is 15 and like her mother doesn’t understand the allure of the ice. Surrounding them are the young men on the team, their friends, and colleagues, each finely drawn and filled in by Backman’s careful hand. For Peter, it is Sune the man who coached him, but is being pushed out due to his age; Kevin has Benji, the player who protects him at all costs, using pain to ease his own secrets; and for Maya, it is Ana, the bestie who practically lives with their family and gives her strength. Is Beartown a novel about hockey? Yes, but you don’t need to be a sports fan to be completely absorbed by the novel. Backman explodes the story off the ice, like a rogue puck shattering the rink’s safety glass. Everyone has to make choices and those choices reveal brutal truths about almost every member of the community. But Beartown isn’t a one-note cautionary tale about the deification of sports and male athletes. For every sentence about the holy bond between teammates there is another that illuminates Backman’s deep understanding of all relationships, whether between husband and wife, parent and child, or best friends. Each is intimately portrayed in all its imperfections and beauty. Even when Beartown reflects an unwelcome and even repugnant point of view, Backman does it with nuance. Yes, there are characters and attitudes that are easy to intensely dislike, but in this way the novel is only holding a mirror to what feels like ever-increasing divides in the real world. It is not always easy reading, but Backman’s considered approach and heartfelt prose make it a not-to-be-missed novel for everyone. Catherine, I was just telling a friend about this book and then opened up your blog page to see this post; I’m so glad you enjoyed it! I’m sure Sarah has informed you that there is a new one (maybe like a sequel?) by Backman coming out next year; I am very excited to read it. A lovely review, as always! I’m very curious what it will be about. It felt as if he wrapped up the major characters in Beartown pretty completely. Although I’d love to follow Amat and Benji! Powder key of a novel?!! You are a genius!! I was working on my Holiday Gift Guide yesterday and called it explosive…powder keg is a much more creative way to say that! As always, great minds thinking alike! You have really been on a roll with great books lately and I love this review! Beartown was such an unexpected surprise, about so much more than hockey. Backman truly is a gifted writer. I read somewhere (???) that Beatown is actually the first in a three book series, so we’ll see how that plays out. I’ll definitely be trying the others! Me, too! I just can’t imagine where he’ll take it. Maybe revisit some of the background characters? Excellent review! I have been so looking forward to reading this after all the rave reviews this year, and my library hold just came in. I’m planning to start it in the next few days–can’t wait!